Welcome to the Hoko River Mouth Retreat! 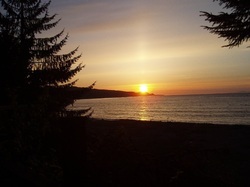 If your group wants a special and isolated ocean and river mouth beach camping experience, including salmon bake, shellfish gathering (when open), discussion of archaeological work in area (especially at Hoko and Ozette), tour of the famous Makah Museum and hikes to Cape Flattery, Sooes and Shi Shi beaches, and/or Ozette Archaeological Site at Cape Flattery, then the Hoko River Mouth Retreat is specially designed for this once in a lifetime experience. The retreat has enough room for up to 50 tents on the beach, a kitchen canopy and fire-pit grills to prepare meals, a covered hot-water shower facility, outhouse with electric lighting and parking at the end of a mile long private gravel road.